One of the best ways to learn about new technology is to have it explained by the people that designed it. From there, working through guided exercises and examples will reinforce the concepts as well as give you a clear understanding of the details. The recent “Designing with Xilinx FPGA: Using Vivado” book will take you from start to finish on these new tools. Xilinx FPGA’s continue to be on the leading edge of programmable logic, and their new Vivado design suite is essential for getting the most out of these new devices. We found this book to be well structured, and covers both the nuanced details as well as the larger overview on it’s topics. We like that each part of the book has been written and developed by a subject matter expert. Each brings their own individual strengths and insights to a chapter at a time. 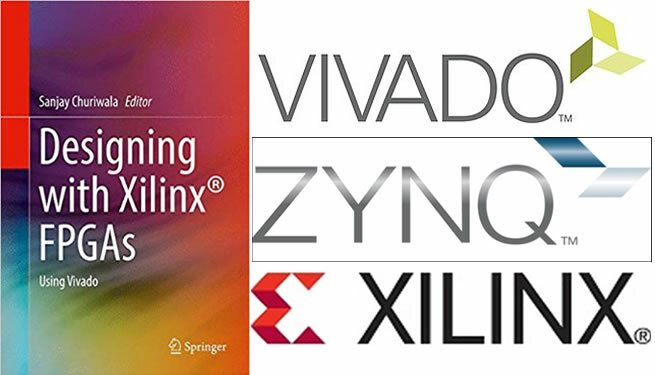 Edited by Sanjay Churiwala, Senior Director of Engineering for Xilinx India Technology Services, “Using Vivado” breaks the learning into about 20 manageable chunks in about 260 pages. Sanjay Churiwala is well suited to compiling this book as he has extensive experience in the field of EDA and semiconductors R&D, as well as customer-interaction. He specializes in Clock Domain Crossings and Synchronization, STA, Power, Synthesis, Simulation, Rule based static checkers, Cell Characterization and Modeling. This book helps readers to implement their designs on Xilinx® FPGAs. The authors demonstrate how to get the greatest impact from using the Vivado® Design Suite, which delivers a SoC-strength, IP-centric and system-centric, next generation development environment that has been built from the ground up to address the productivity bottlenecks in system-level integration and implementation. This book is a hands-on guide for both users who are new to FPGA designs, as well as those currently using the legacy Xilinx tool set (ISE) but are now moving to Vivado. Throughout the presentation, the authors focus on key concepts, major mechanisms for design entry, and methods to realize the most efficient implementation of the target design, with the least number of iterations. For the last three years, I’ve searched for a book on designing with FPGAs—specifically Xilinx FPGAs—that I can recommend to people who are just starting out. The introduction of the Vivado Design Suite in April 2012 complicated things because existing books on FPGA-based design did not discuss Vivado. Now, there’s a 260-page book from Springer that I can recommend. The book title is “Designing with Xilinx FPGA: Using Vivado.” That’s pretty self-explanatory, isn’t it? You might be able to teach yourself all of the topics in this book by collecting dozens of different documents on the Xilinx.com Web site. You’ll find it a lot easier just to get this book. This newly published book covers extremely current topics including Stacked Silicon Interconnect (the Xilinx designation for 3D ICs) and the Xilinx Zynq UltraScale+ MPSoC. Of course, just as it says in the book title, the text heavily discusses the use of the Vivado Design Suite to develop designs with Xilinx devices. Read through the materials and work on each exercise to gain a deep understanding of this technology.